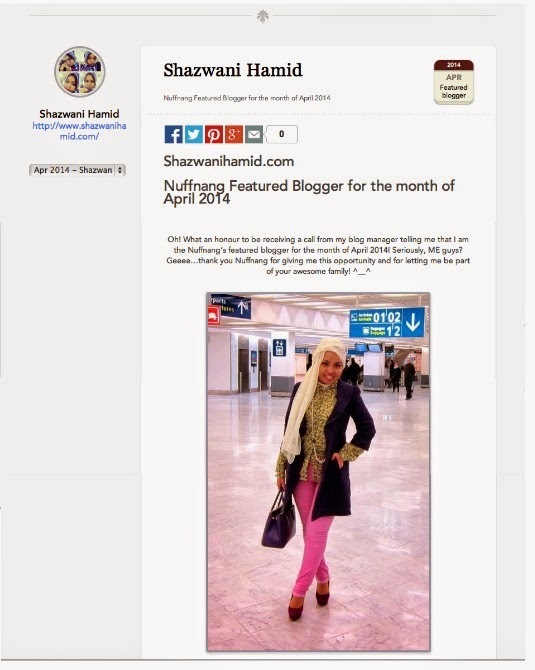 I was surprised to know when Nuffnang called me last month, and said I am the Nuffnang Featured Blogger for the month of April 2014! I mean, I know I rarely update this blog nowadays (blame the husband! hehee :p), so when they informed me on that, I was quite surprised that they would still feature me on their page, being a bad blogger that I am! hahah. But really, what a nice thought! I'm so honored! Thanks guys! tahniah dear.. baru baca di Nuffnang.. terus rs minat dgn blog ni..
tahniah, keep on writing. nice blog. Nice blog.. Very nice one..